Artificial antenna. 50 ohm, 175 watt non-inductive resistor mounted on 3-1/2" x 19" rack panel. Brushed aluminum. Includes 12 vdc change-over relay with SO - 239 connectors. Harris broadcast band dummy antenna. 1,200 watt, 73 ohm, 0.1 - 5 MHz. 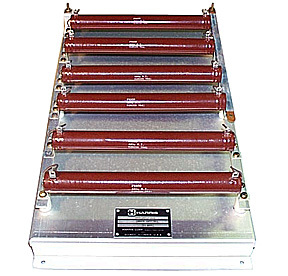 Consists of six, 200 watt, 420 ohm non-inductive resistors in parallel. 12-1/2" x 21" x 5"H. Harris P/N: 994-3483-001. Barker & Williamson long wire simulator: Dummyload. 100 watt, 300 ohm. Weather tight enclosure. 9-1/2" x 11-1/2" x 4-1/4" high. Uses (4) 75 ohm, 25 watt carborundum resistors.